From 'one of the great American writers of our time' (Los Angeles Times Book Review) - a brilliant historical crime novel, a pulse-pounding, as-it-happens narrative that unfolds in Los Angeles and Mexico in the wake in Pearl Harbor. January, '42. L.A. reels behind the shock of Pearl Harbor. Local Japanese are rounded up and slammed behind bars. Massive thunderstorms hit the city. A body is unearthed in Griffith Park. The cops tag it a routine dead-man job. They're wrong. It's an early-warning signal of Chaos. There's a murderous fire and a gold heist, exploding out of the past. There's Fifth Column treason - at this moment, on American soil. There are homegrown Nazis, commies and race racketeers. There's two dead cops in a dive off the jazz-club strip. And three men and one woman have a hot date with History. Elmer Jackson is a corrupt Vice cop. He's a flesh peddler and a bagman for the L.A. Chief of Police. Hideo Ashida is a crime-lab whiz, lashed by anti-Japanese rage. Dudley Smith is a PD hardnose working Army Intelligence. He's gone rogue and gone all-the-way fascist. Joan Conville was born rogue. She's a defrocked Navy lieutenant and a war profiteer to her core. L.A., '42. Homefront madness ascendant. 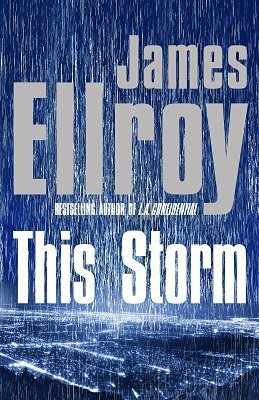 Early-wartime inferno - This Storm is James Ellroy's most audacious novel yet. It is by turns savage, tender, elegiac. It lays bare and celebrates crazed Americans of all stripes. James Ellroy comes to Manchester to talk about his brilliant new novel. James Ellroy comes to Glasgow to discuss his brilliant new novel.